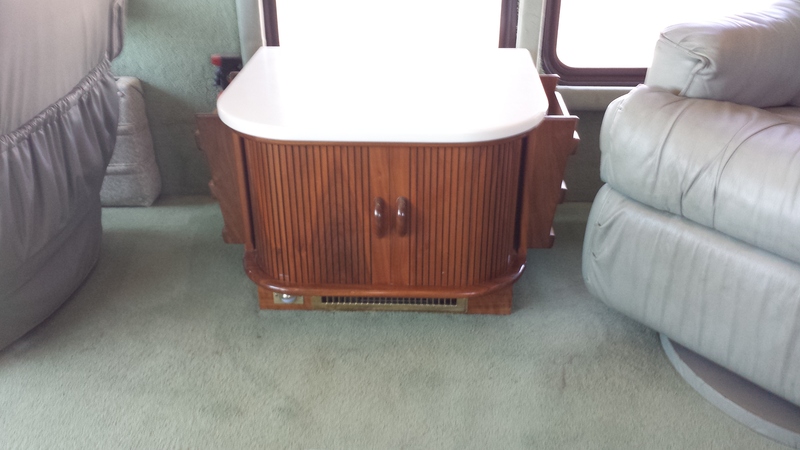 space in both bathroom and bedroom areas and includes a full Kitchen/Living Room Slide. Air Horns, Remote Controlled Spotlight, newly serviced alternator, NEW tires, 2 pull-out cargo trays (aka Joey Beds), 50 Amp service with power cord reel, side radiator, Clear fiberglass Coach Armour front rock shield, door bell, zip-dee window awnings, NEW (Oct, 2013) Oasis Combi furnace/continuous hot water system upgrades the original Hurricane System, Girard power patio awning w/wind sensor and remote controller, Wingard Amplified TV Antenna and King Dome In-Motion Satellite Antenna, vinyl/cloth tire covers and black mesh windshield and side front window covers for use while parked, Falcon Tow Package with tow car brake controller package, slide out battery tray with battery disconnect switches for use while stored and "Beaver Service Center" which is covered by a lockable door at the passenger side rear of the coach and contains access to filters, remote start switch, air system water drain valves, leveling control panel (same as driver's unit), towel dispenser, work light and more. 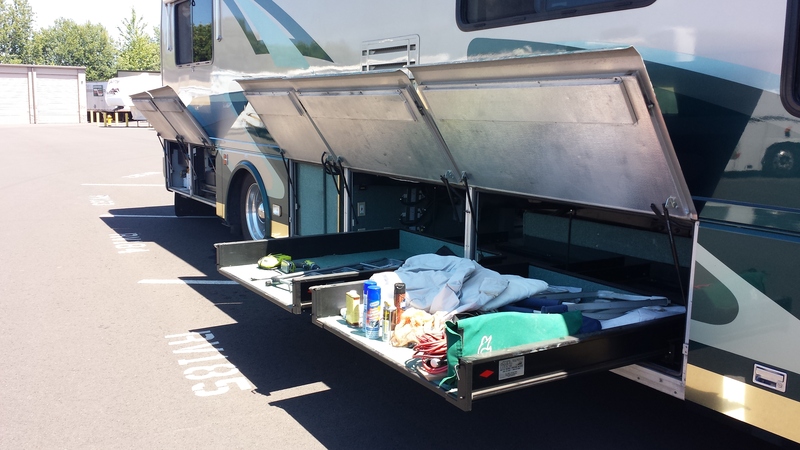 Basement doors are of aluminum with central locking from inside the coach. 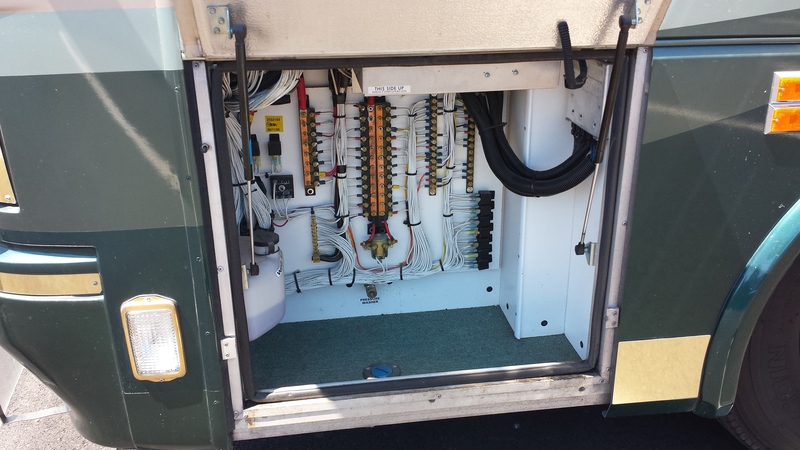 Basement areas are lighted and controlled by a switch inside the coach. 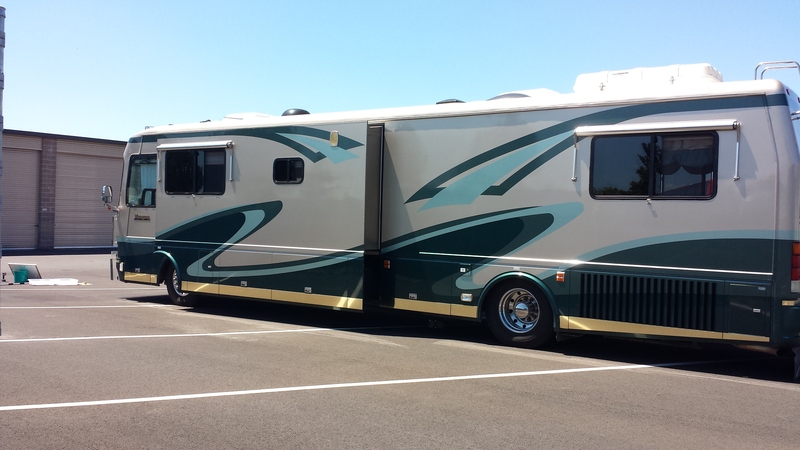 Exterior Skin Condition - Full body paint with Clear Coat, Gold metallic skirting, all in excellent condition. 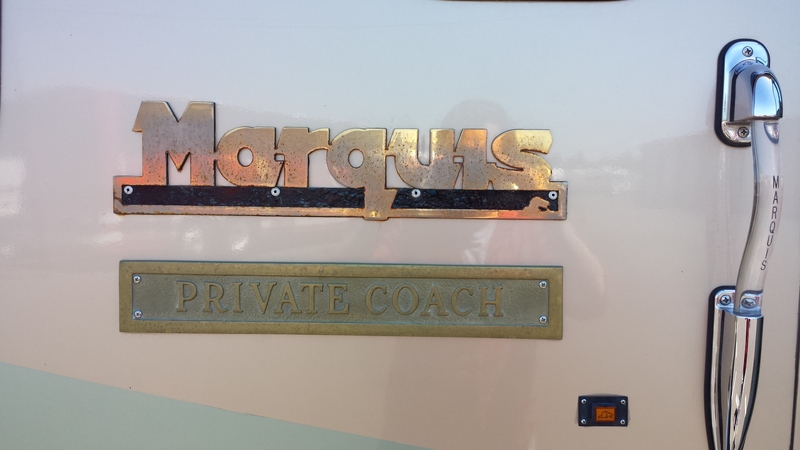 There are 3 Beaver Marquis badges on the coach and all three contain what appears to be rust dots in their gold metallic color surfaces. 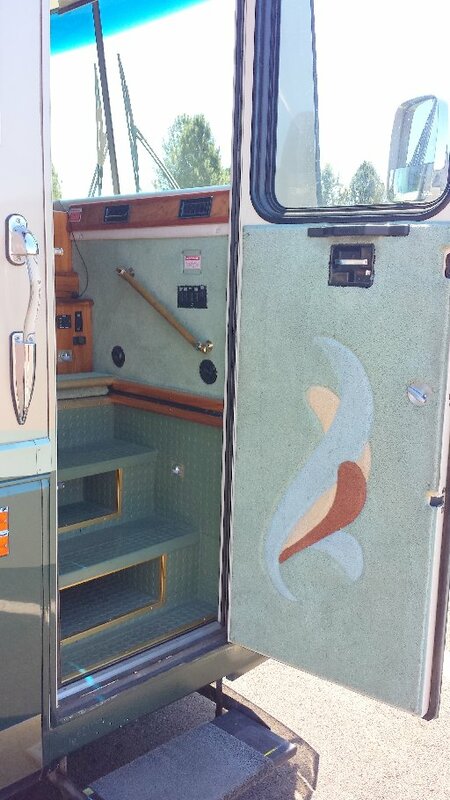 Interior Features - An Aircraft quality door with hand sculpted carpet on its sidewall welcomes visitors inside this coach. A Phantom Screen Door retracts when not in use. Make sure visitors drop their muddy shoes into the convenient front stair storage cabinets because you'll want to keep the inside immaculate. As you step into the interior of this Beaver Coach you'll be impressed with the cockpit that includes the (most up to date software revision) coach's Silverleaf computer monitoring system, a new navigation system, and driving controls including those for the heated outside mirrors, a CB Radio, air powered step well cover, coach generator unit, even a wash system for the rearview camera. 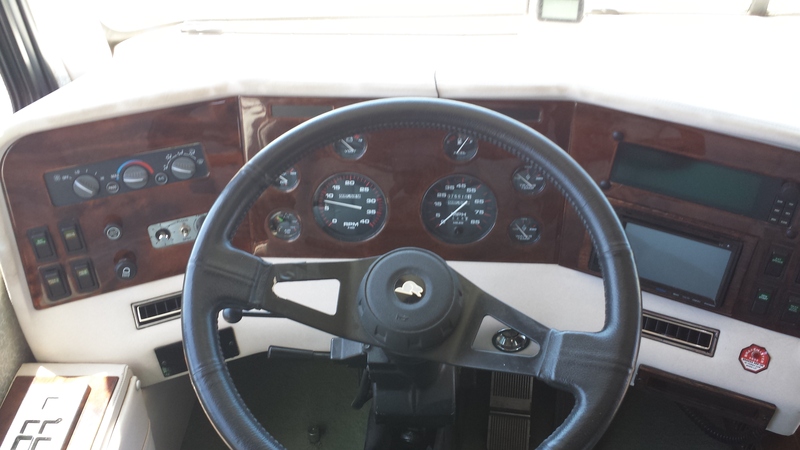 Other driver/passenger amenities include cruise control, tilt and telescoping Steering Wheel, 6 way power seating and extremely comfortable captains chairs including a power foot rest for the passenger. 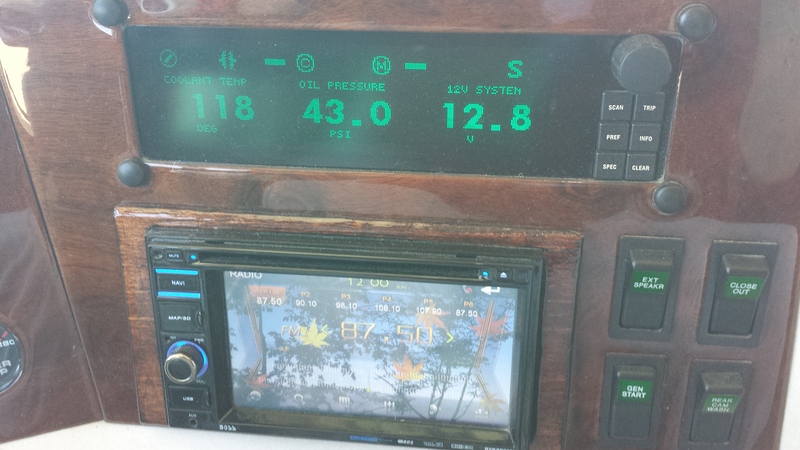 Individual heating and cooling comfort zones exist for the front passengers. Camping in the wilderness, and not sure what that is outside? Remote control your outdoor spotlight and find out. 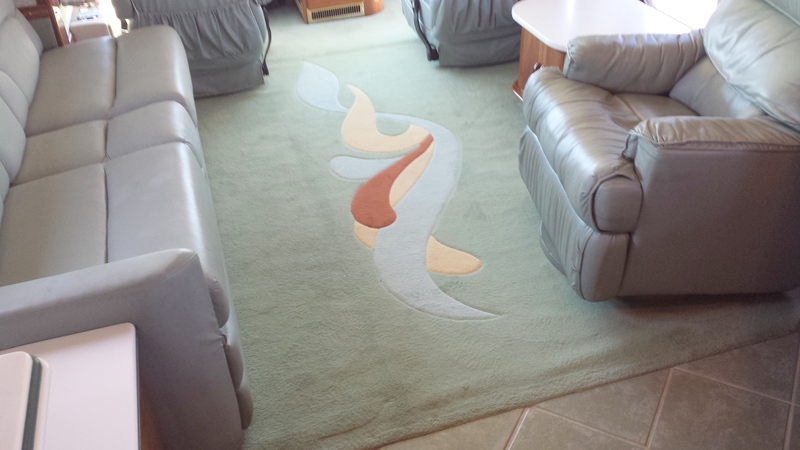 The hand sculpted designer carpet (was covered with plastic its entire life up to September 2013) warms the living room and bedroom floors. 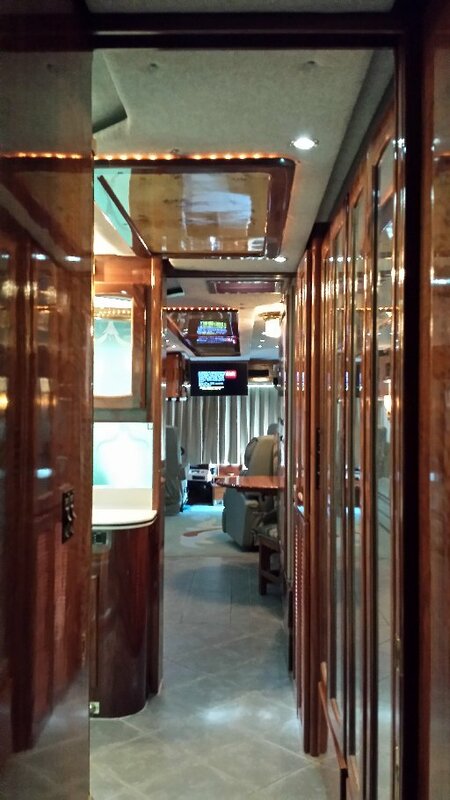 The entire coach inside living (40 pot lights and also AC Fixture Lighting) lighting has been updated with LED bulbs which conserve battery power by 90% compared to the original halogen pot lights and incandescent bulbs. They also are cool to the touch. 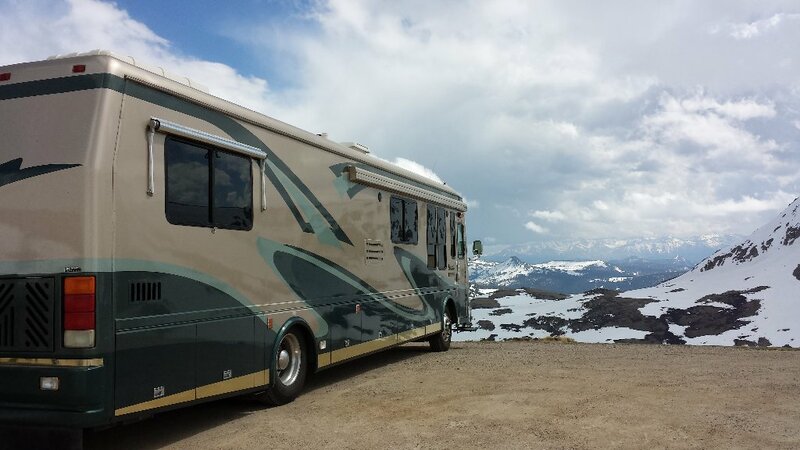 A Prosine 2500W inverter draws power from the 6 coach batteries to power nearly all the wall outlets in the coach along with the entertainment system, hot water dispenser, ice maker, even the refrigerator if desired. 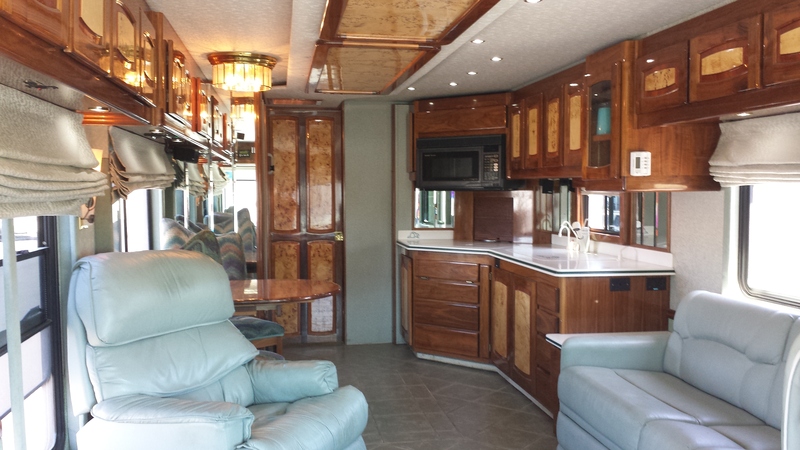 Beautiful high gloss walnut push to open cabinets and doors with mappa burl inlays and decorative ceiling panels (featuring indirect lighting) are throughout the coach's interior. 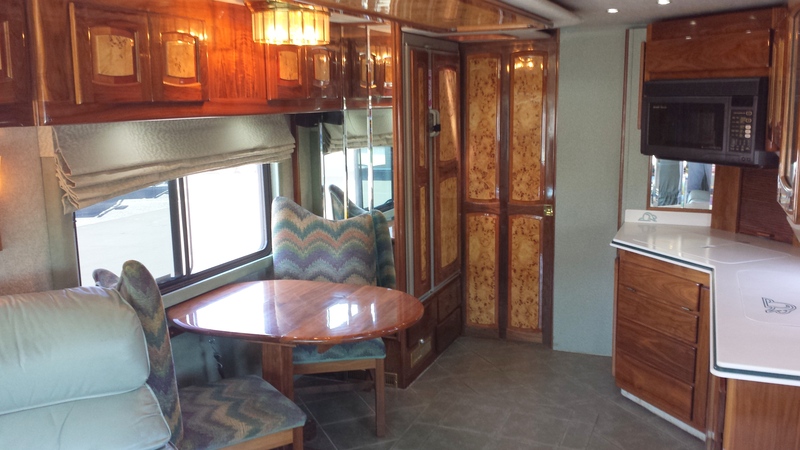 The hand crafted wood work alone represents the entire resale price of this coach! During the day and night control the natural lighting by using the powered window coverings including day shades and roman shades (shown above) for nearly total blackout. The dual pane windows then shut out the noises of the world allowing for a perfect night's sleep even in the occasional Walmart parking lot. The original 2.1 Bose analog surround sound system with 20 inch CRT TV has been replaced with a 5.1 digital surround sound system with 32" HDTV. 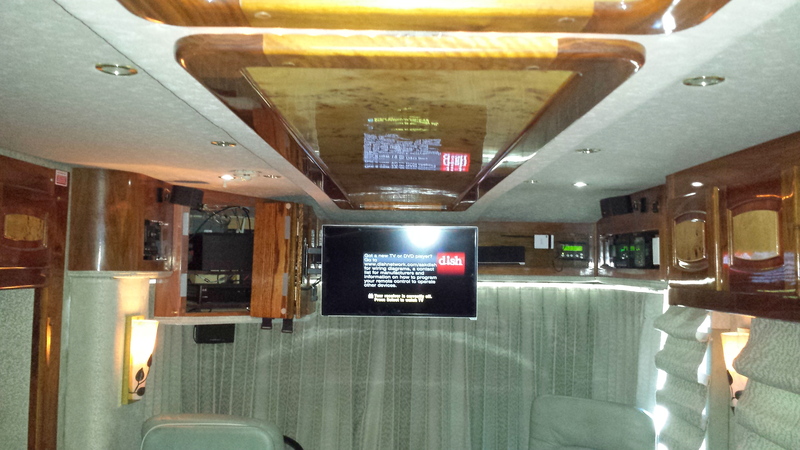 This coach is perfectly sized and speakers perfectly positioned to enjoy movie house quality audio. 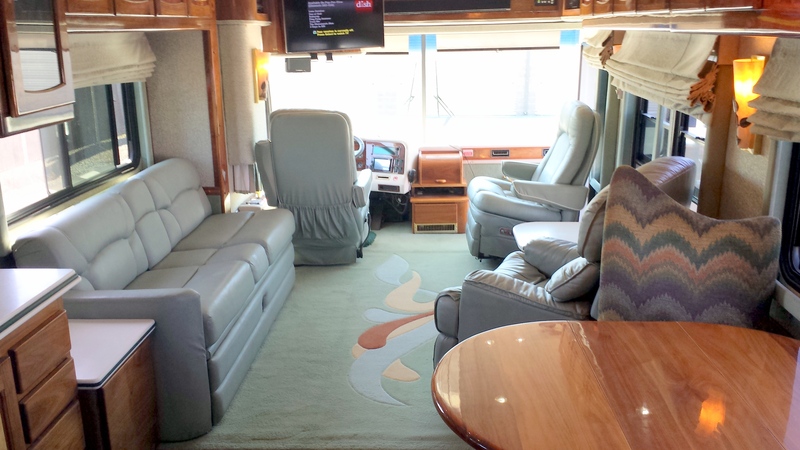 The living room includes both a jack-knife sleeper sofa and very comfortable large recliner - both of durable easy care ultra leather. 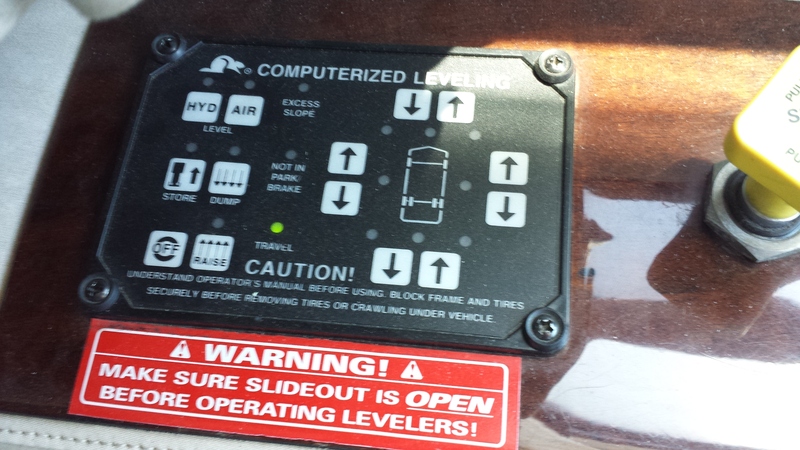 Easily accessible is the 3 zone heating and cooling thermostat. The galley area includes a side by side New Dimensions 12 cubic ft refrigerator w/ice maker, along with filtered instant boiling hot and cold water dispensers at the kitchen sink. A two way spray/stream removable faucet and dish liquid dispenser also adorn the large corian double sinks. 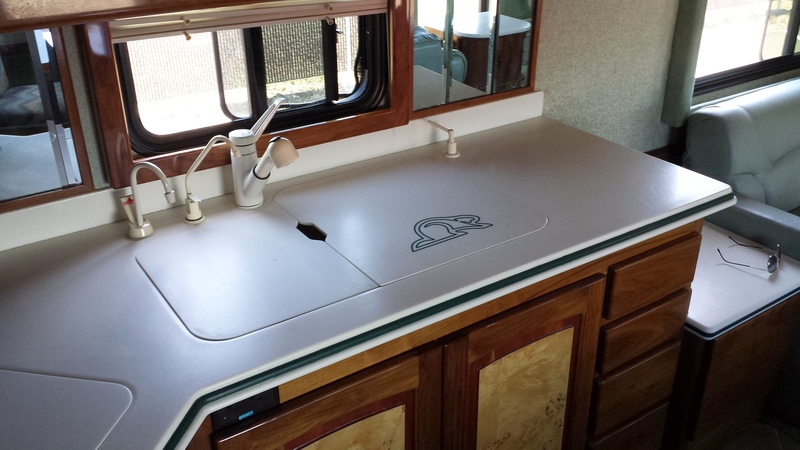 A countertop dishwasher (not pictured above but see additional pictures at the end of this narrative) sits to the right of the sink area - instead of a draining board. 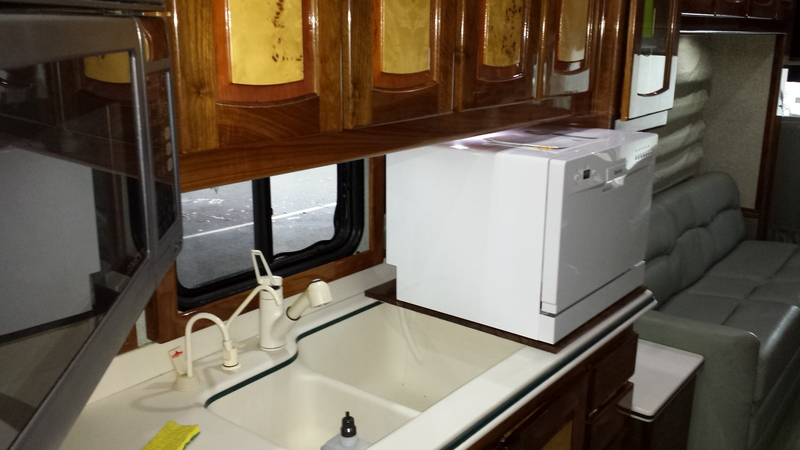 Though the dishwasher installation is "permanent" in that it travels in this configuration and doesn't need to be put away while driving it can be easily removed and the kitchen area can be returned to "stock condition". Porcelain tile distinguishes the kitchen and bathroom from the living and bedroom carpeted areas. A Sharp micro/convection oven, paired 6k and 9k BTU Gaggenau gas stove top, appliance garage, plus special knife drawer w/cutting board provide the tools required by a gourmet cook. 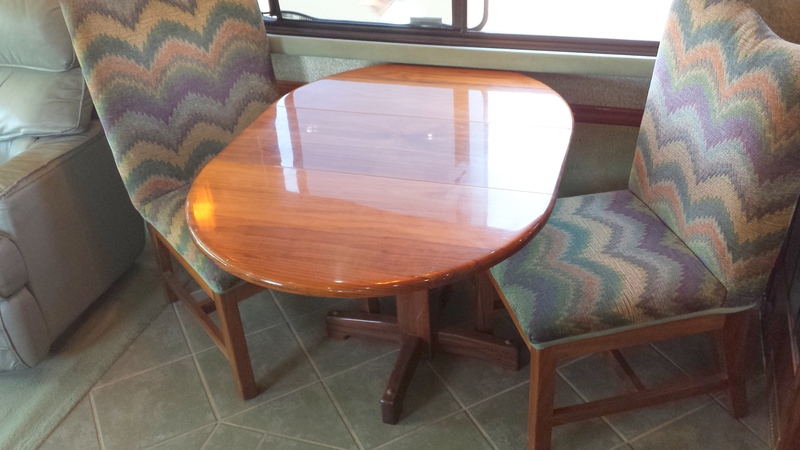 A four person kitchen table (2 additional chairs are in the bedroom closet) slides in and out, making seating easy. In addition to numerous dual pane windows, two automatic fantastic fans with rain sensors (kitchen and bathroom) serve to control the temperature inside in milder climates where neither heating nor air conditioning is required. 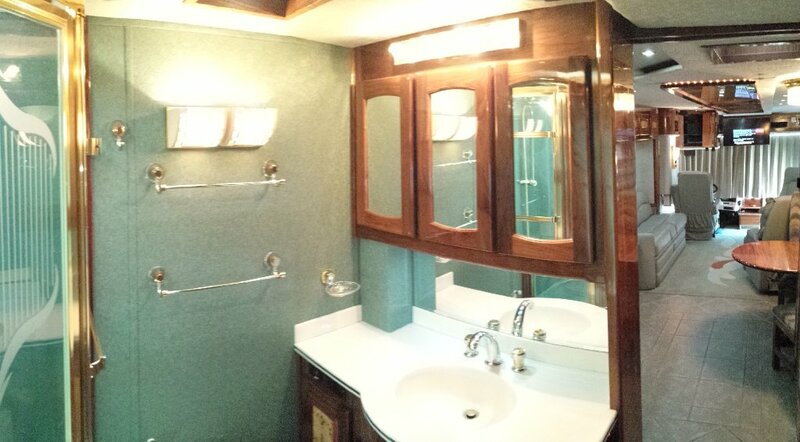 All counter surfaces in this coach are of Fountainhead (same material as Corian). 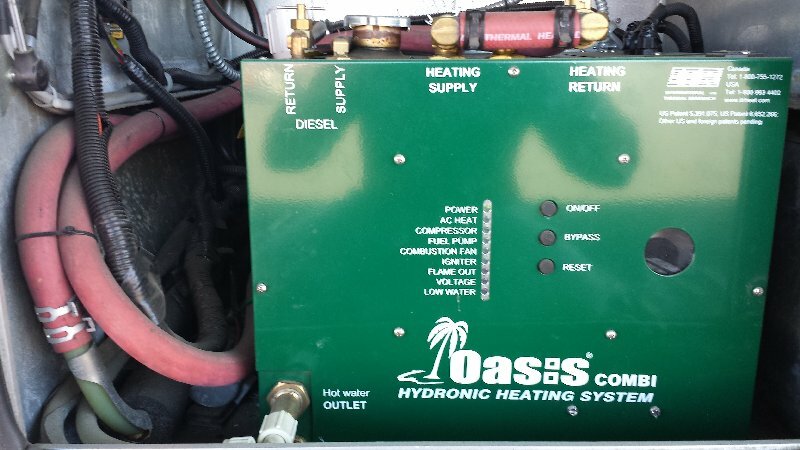 The coach interior zones and its hot water supply are heated by a recently installed ITR "Oasis Combi" system, by way of 5 2-speed fan (140cfm per fan) equipt radiating units serving independent thermostats located in the Living Room/Galley, the bathroom, and the bedroom (plus a basement heating zone to prevent freezing of water pipes in the winter). 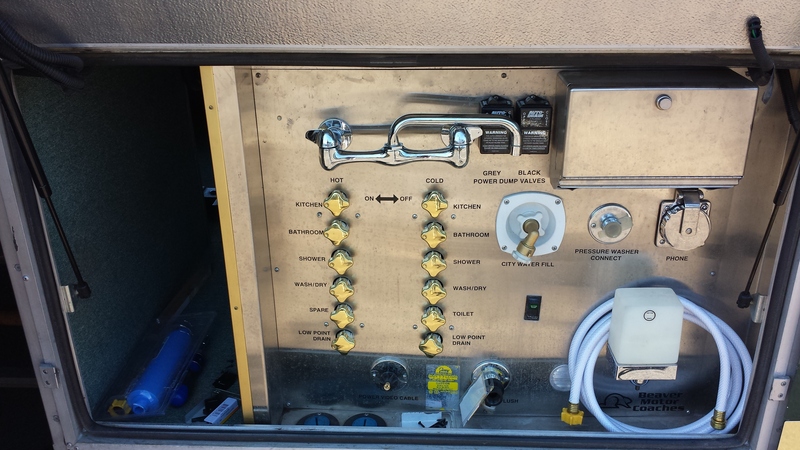 This updated system replaced the original "hurricane unit" in October of 2013 and offers both an increase in output BTUs over the original in addition to the added ability to heat the coach with an electrical element within the system if you are using the generator or have a shore connection. 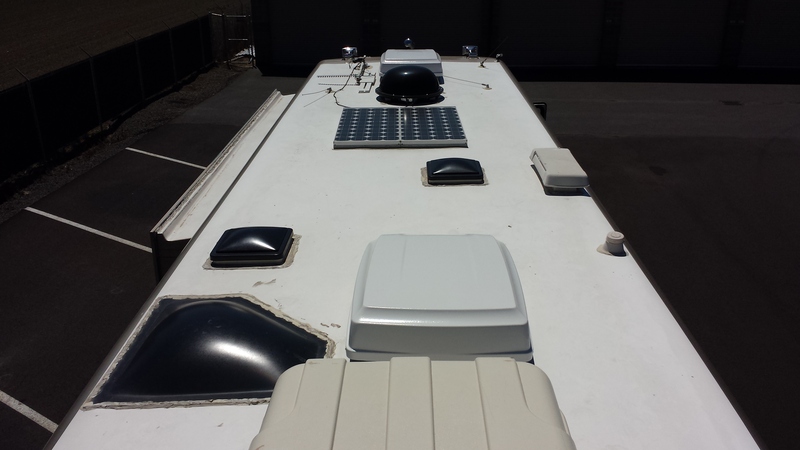 Cooling for the 3 zones is by way of 2 roof mounted air condition units allowing independent temperature control in the living room, bathroom and bedroom. A cabinet with Fountainhead (corian) top is convenient for storage of computer gear and completes the living room ensemble. 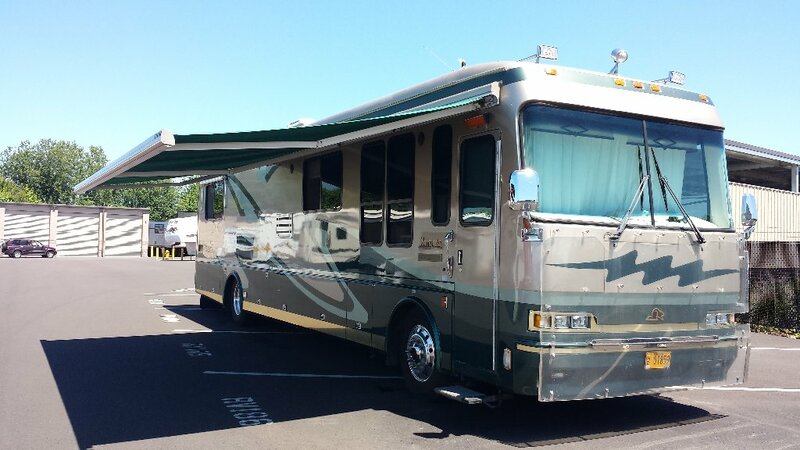 Privacy is achieved by way of power day and night shades throughout the coach and a power curtain across the front windows of the coach. 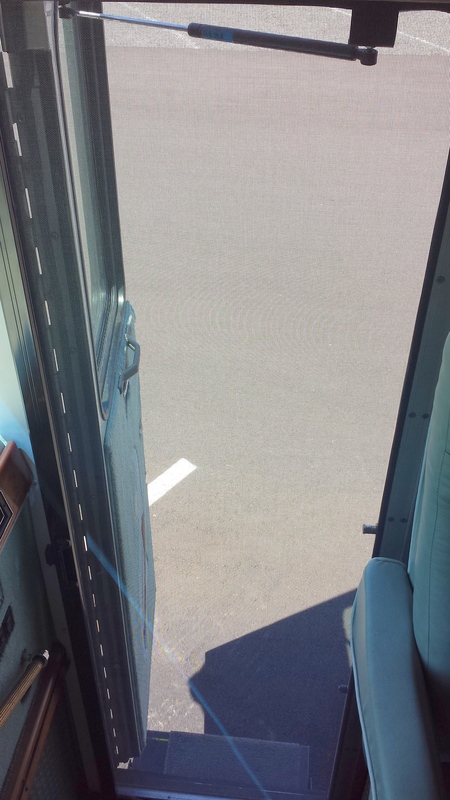 While parked in hot sunny climates you can attach the outer sun block curtains which serve to block both the sun and viewing from the outside of the coach while allowing viewing from the inside to the outside. 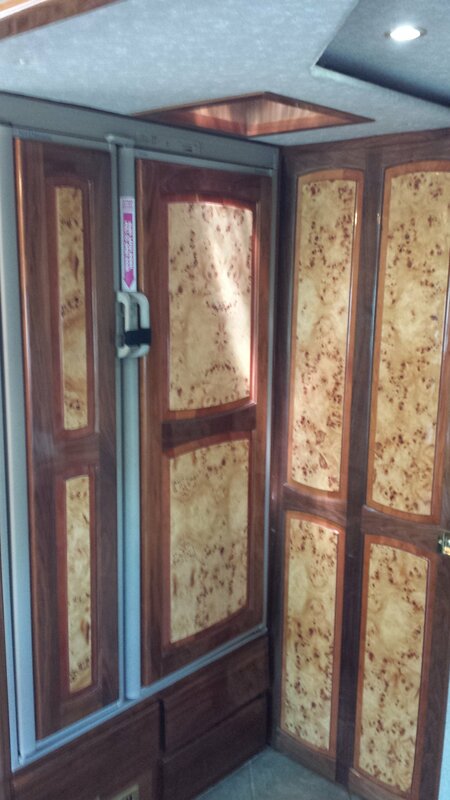 Beautiful solid walnut privacy pocket doors lead to bath and bedroom. Bathing is enhanced by the extra large "garden tub" and shower, and a porcelain toilet along with a beautiful wood and Fountainhead (corian) vanity (with clothes hamper) with Moen fixtures complete this large space. There is an abundance of storage with cedar lined closets with shelving and drawers and mirrors throughout both bathroom and bedroom. You'll enjoy this large bathroom area as both shower area and dressing room. The powerful exhaust fan removes the shower moisture quickly. 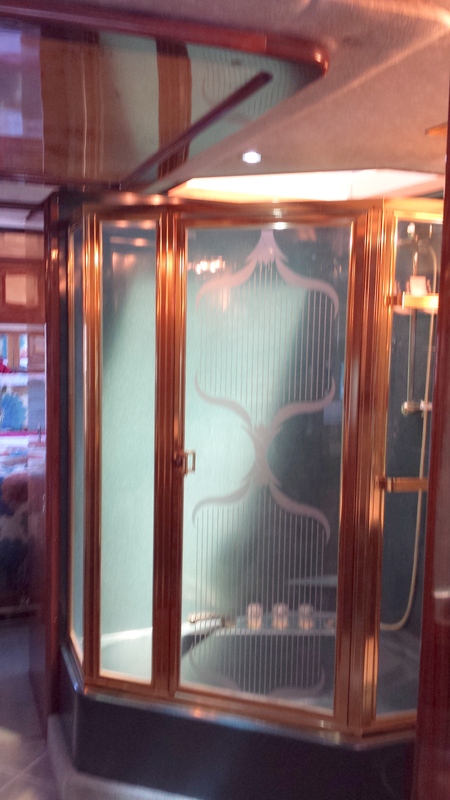 The Tourmaline is noted for its storage and the above picture shows the 2 storage cabinets in the bathroom (to the right side and mirrored). 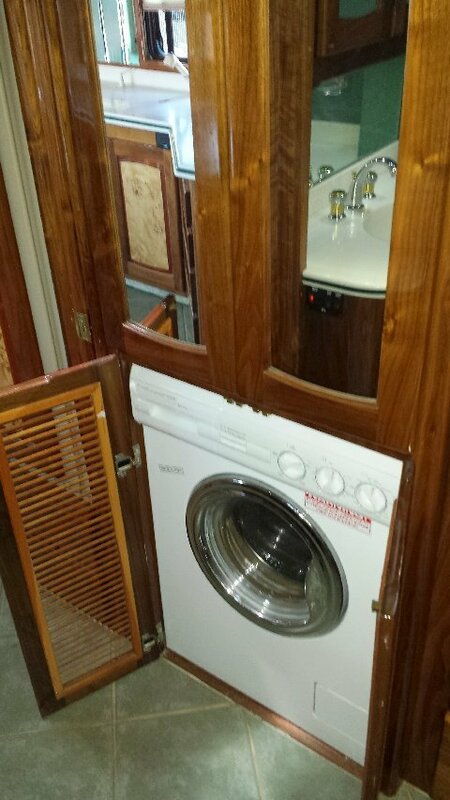 There is also pantry space available above the condenser washer/dryer located close by the Galley and shown below. In addition to these storage locations, the bedroom also features a double closet in addition to other drawers and cabinets at both ends of the queen bed. 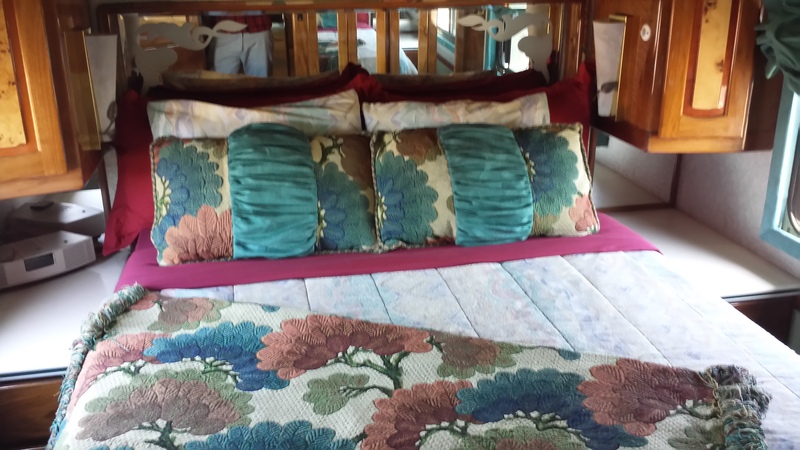 This oversized RV queen bed with memory foam topper will provide a restful sleep to energize you for the next day's adventures. From your pillow you have control of the coach's generator, individual reading lights, along with outdoor lighting that surrounds the coach for security. Both bedroom and bathroom temperatures can be independently controlled. 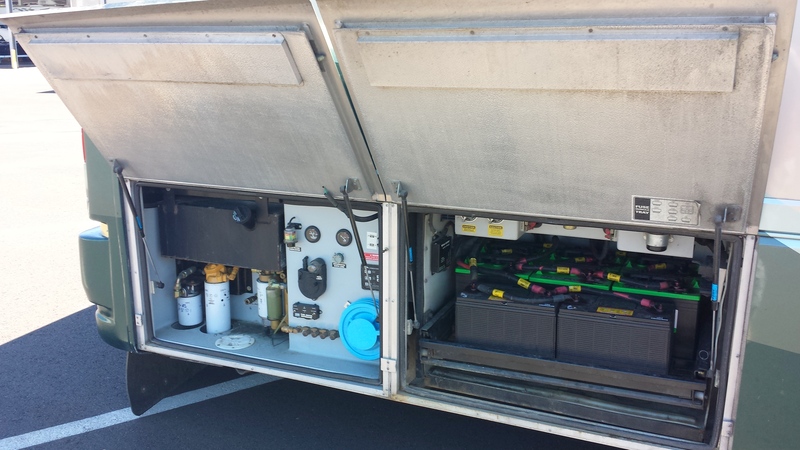 Service Information - Where advised this coach has had engine and drive train fluids replaced with synthetics designed for high mileage service intervals. The rear differential contains new synthetic gear oil, the transmission has been drained and filled twice with TES-295 transmission fluid with extended service intervals (4 years or more - "never again" according to the truck service center that performed the service). 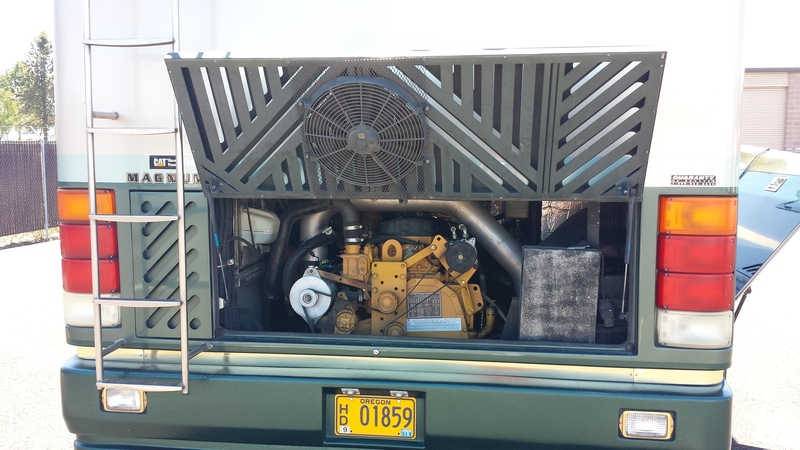 The cooling system contains Organic Acid Technology coolant with a change out interval of 600,000 miles. These services have been done to limit the yearly expenses of engine maintenance and are recommended by the various part manufacturers of the engine and drive train. Even the oil change is only recommended every 25,000 miles or 2 years. 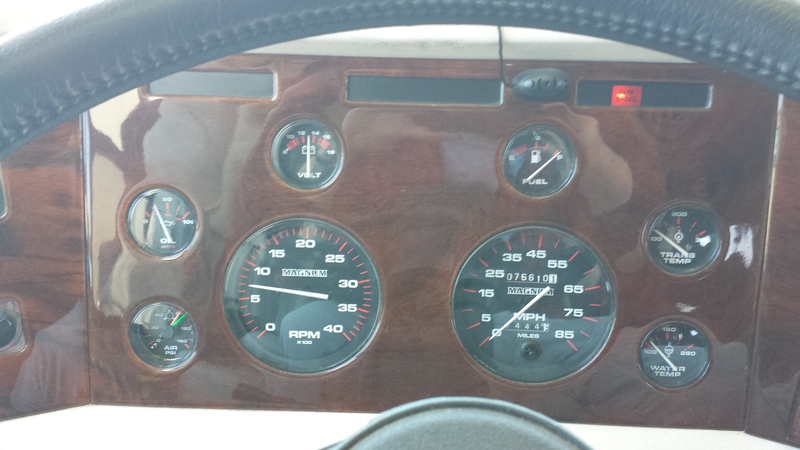 At that interval even with a nine gallon oil capacity, this maintenance is cheaper than a passenger car's recommended oil changes of every 3000 miles. Entertainment System - The original Bose 2.1 surround sound system with standard definition satellite antenna of the late 90s has been removed except for the Bose speakers and replaced in the fall of 2013 with King Dome in-motion satellite antenna, Dish Network HD Receiver, Vizio 32 in HDTV with 5.1 digital surround sound bar system including wireless subwoofer and bose speakers. 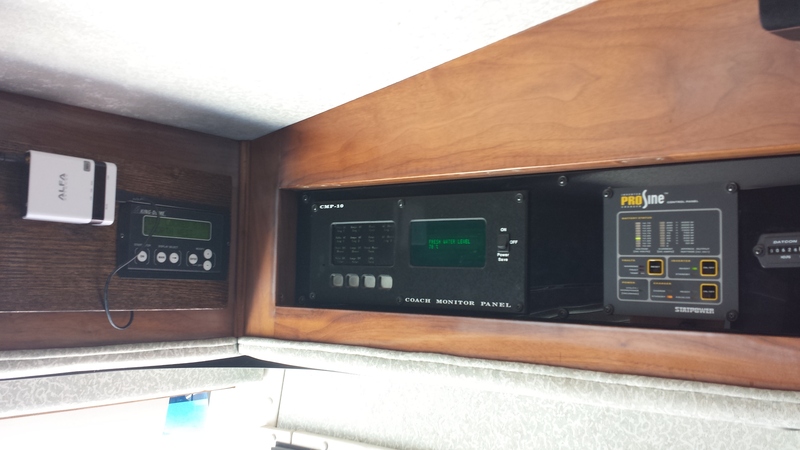 The original Delco AM/FM radio has been replaced with a new Boss Stereo touch screen head unit with navigation, Bluetooth for phone, CD, USB, Ipod adaptor, AM/FM radio integrated into the new Vizio entertainment system. 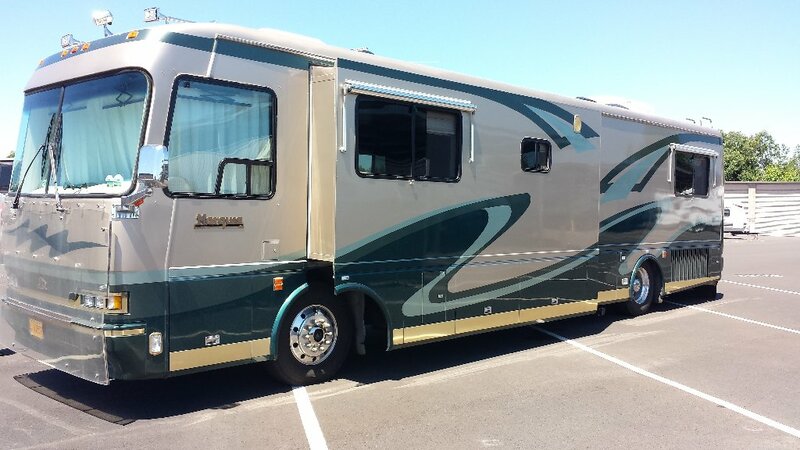 The asking price for this coach is $75,000 and is below the low retail and average retail NADA values (what you would pay at a dealership that doesn't know the coach). Those values can be found using this link - http://www.nadaguides.com/RVs/1999/Beaver/Tourmaline/3002662/Values. This pricing is for stock units, and do not include adjustments for options of any kind. The asking price is FIRM but would include negotiated "punch list items" if any for repair. 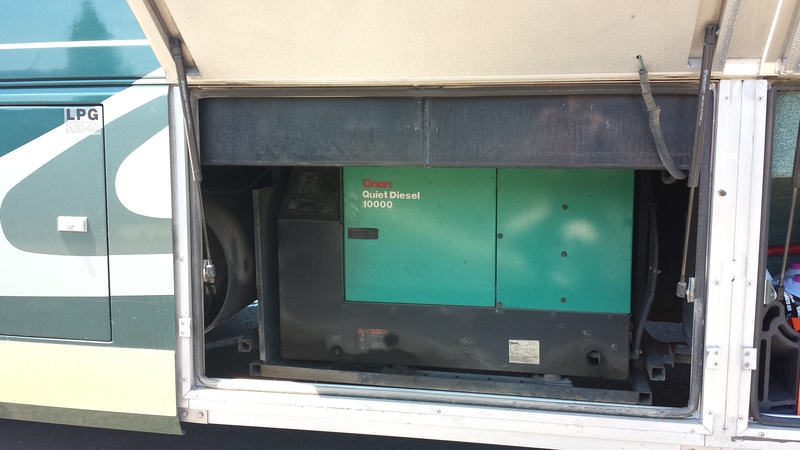 Unlike a dealer's unit, this coach is recently used and the features except for the on board pressure washer are guaranteed to work. 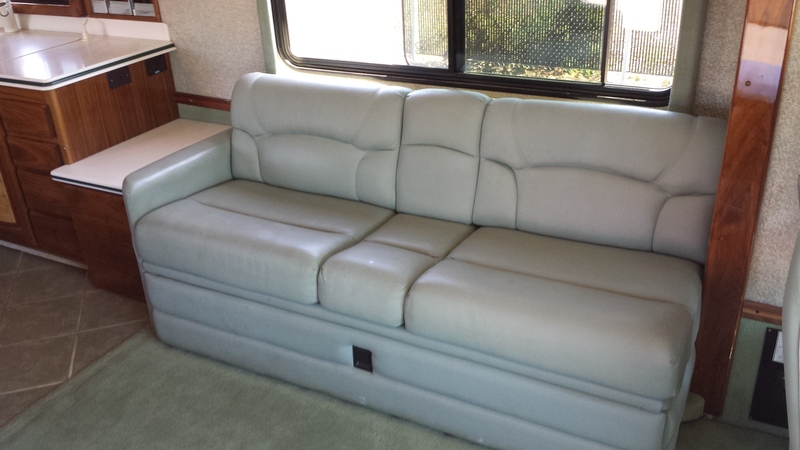 The manufacturer's list purchase price (without options) of this coach is shown to be $440,000 in 1999. 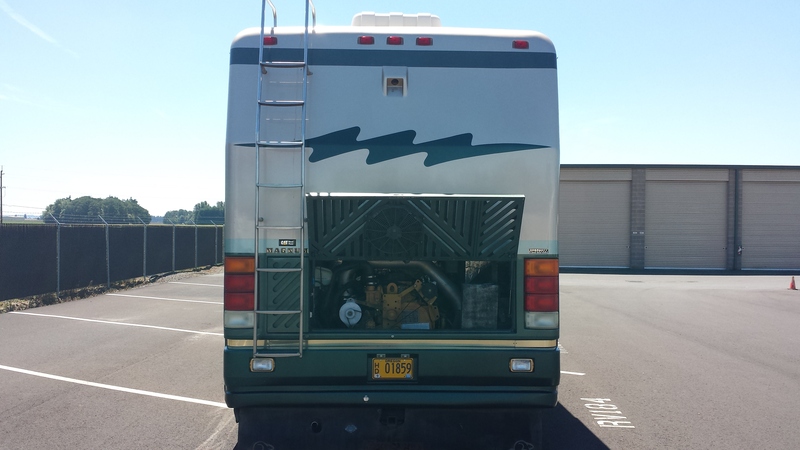 Please be knowledgeable about the Beaver Marquis Coach, and have available funding for the purchase before asking to inspect this coach as it is stored, off-site, in covered storage about 30 miles away in Hubbard, OR. If after reviewing the information on this web page you meet these requirements and are interested further, then contact the seller via the email in the original ad with your phone number and the seller will call you regarding this coach.